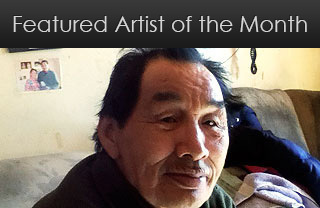 Gilbert, one of Canada’s leading Inuit carvers was born and raised on Labrador’s north-east coast. In his 20s, he left Nain to seek employment and adventure in western Canada. 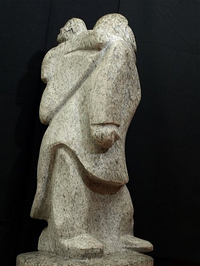 In Edmonton for four years, he carved for an Inuit art gallery and discovered that his passion and his pathway was in carving stone. Returning after this to his home in remote northern Labrador, he chose the life of his hunter-gatherer ancestors, carrying on what became a 40 year career as a carver. 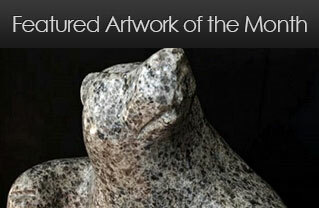 Having tried, in his early years, drawing and print-making, it was carving that he excelled at and kept coming back to. Here he could experiment with his distinctly philosophical and mythological works in whalebone, soapstone and serpentine, creating his characteristic medium-sized and larger multi-faceted sculptures. In the first decade of the 20th century, Gilbert’s work has borne all of the his usual hallmarks of humor, realism and touches of abstraction, but mostly now in recent years, with anorthosite (nick-named “blue-eyes”), a much harder granite-labradorite stone that occurs naturally in and around Nain. 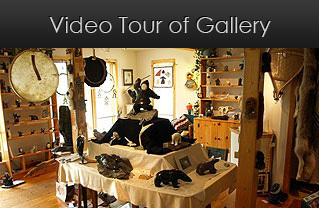 Gilbert does not travel as much as he used to, but continues to be a favorite world-wide with collectors of his signature pieces.